The Short: This is an awesome book. It is so much fun to read and I’ve read this book many times over. I love it, my son loves it, and my husband even loves it. We highly recommend this book. 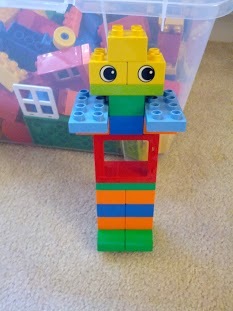 My son and I created a Duplo inspired Cookiebot the other morning. We then spent the morning playing with our homemade Cookiebot. It was good times. The characters are excellent. I didn’t feel the need to edit anything when reading this book to my two-year-old son. It is a lot of fun to read out loud — especially when you say, “Cookiebot” in a dramatic superhero voice. The only downside is that this book leaves you craving cookies and milk — but then again, is that really a downside?